This Belleek clock was introduced in 2012. This Belleek clock is named the regency mantel. The Belleek regency mantel clock is crafted of fine china that is enhanced with gold accenting along with an embossed motif. The Irish mantel clock measures 6 1/4" wide x 8" tall x 3 3/4" deep and it is handmade and hand-painted in Belleek, Ireland. 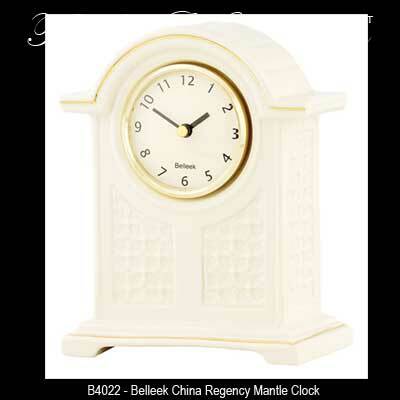 The Belleek mantel clock is gift boxed, complements of The Irish Gift House.